Shirts With Random Triangles: Georgia learns to adapt to QB Hutson Mason's style of offense. Georgia learns to adapt to QB Hutson Mason's style of offense. 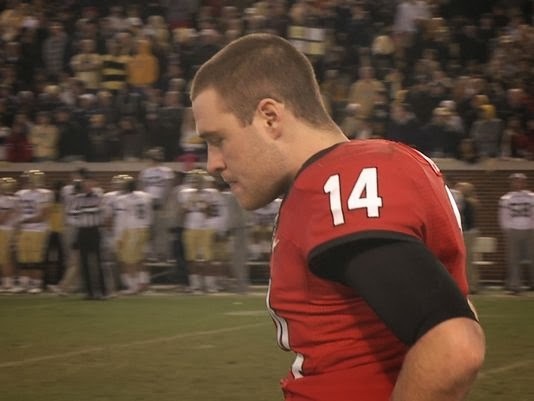 Georgia quarterback Hutson Mason found himself thrown into the fire a couple of weeks ago when Aaron Murray went down with a season-ending ACL injury during the Kentucky-Georgia game. Mason went on to lead the Dawgs to an 59-17 win over the Wildcats, but had to come from behind to win in double overtime against Georgia Tech last Saturday. The trouble there was that Georgia was also thrown into the fire with Mason, as it wasn't quite used to his more up-tempo hurry-up style offense. That led to the Dawgs going down 20-0 early in the game. The team managed to adapt and finally defeat the Jackets 41-34, but it was difficult learning experience. Mason's hurry-up style of play goes back to his days quarterbacking at Lassiter High School in his home town of Marietta, Ga.
"I like to keep things going a little quick," Mason admitted. "Not like Oregon, you know, but I just have a tendency from playing at Lassiter, we were a no-huddle offense, so just by my nature I'm a little faster than Aaron." Georgia wide receiver described Mason's style of play in the Kentucky-Georgia game. "As soon as the play's over, he's yelling, screaming to get everyone on the ball, let's get another play going," Bennett recalled. "It's good, but that one-minute drive, for instance, right before the half, I was sucking [wind]. I was dying. But it's just the way he rolls." Georgia will have a little more time to adapt between now and its bowl game (which is looking more and more like the Gator Bowl) to adapt to Mason's style of offense. It will hopefully have gotten all the kinks worked out by the start of the 2014 season. ESPN does the inevitable and hires Tim Tebow. Johnny Manziel meets a Chick-fil-A Cow. The Fallout: Christmas Day edition. Tre Mason has socks with his picture on them. Mack Brown is an ex-Texas head coach. Is Mack Brown an ex-Texas football coach? Covering Dixie: Your SEC Bowl schedule edition. A "Kick Bama Kick" t-shirt? Of course there is.